The smart new restored Valletta Waterfront, incorporating the cruise terminal, is a thriving cosmopopiltan place to be seen in. 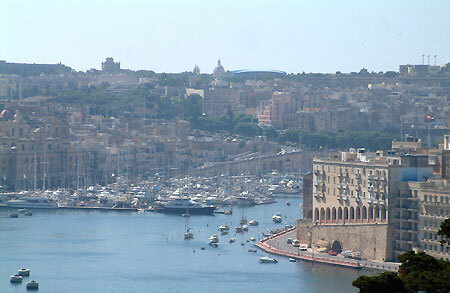 It offers vsiitors fantastic views of the Grand Harbour, good shopping, restaurants and banks. The Waterfront is steeped in history. This is where the Knights of St John used to load and unload their goods and no doubt the Turks before them. Old 18th century warehouses have been spruced up for modern living, the 18th century Church of The Flight from Egypt by the Holy Family has been restored. Enjoy lunch or dine in style at the Valletta Waterfront. If you are interested in boats and sailing, there is an annual boat show in Valletta.